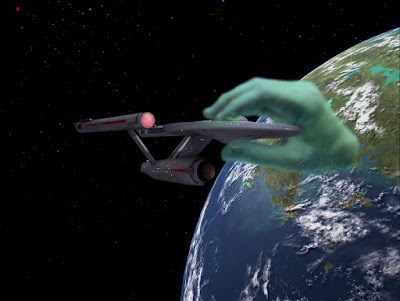 The Enterprise is doing a little routine planet mapping and is on approach to Pollux IV an unremarkable world with no records of being populated but they detect an object approaching them in the shape of a giant human hand. Spock says it's pure energy but it tracks the ship's efforts to evade and grabs hold of them in the manner of a very powerful tractor beam. The optical scanners pick up an image of a human face, audio is also being broadcast towards the ship and the entity welcomes and praises them for the journey they have undertaken and being so far from their homeworld. 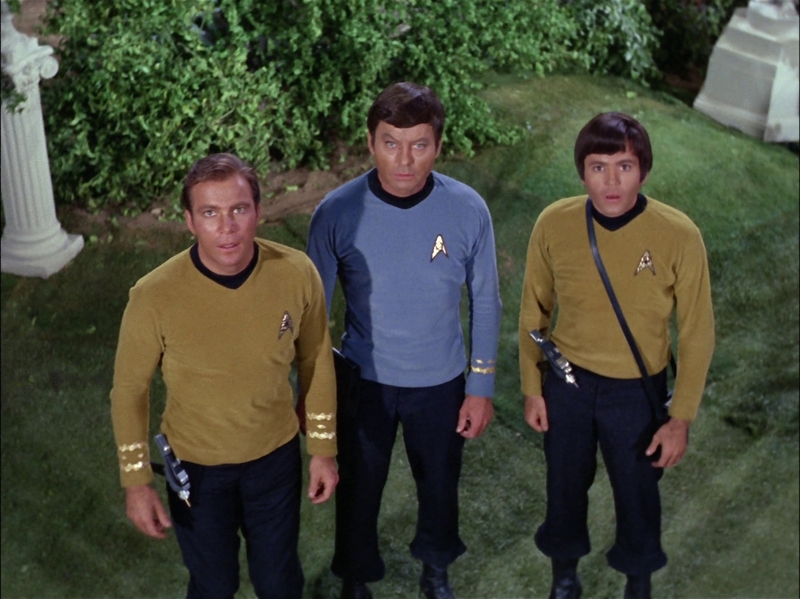 Kirk is a little put out but nothing seems to phase this being and he invites the Captain and his officers (not Spock though) down to the planet. Upon arrival they are greeted by a scaled down version of classic Greek architecture and the being now in standard human form lounging on a what amounts to a throne. He greets them and introduces himself as Apollo the very same from classic mythology, again he is pleased by the development of his "children" and especially the beauty that is Lieutenant Carolyn Palamas but soon he shows his impatient side as the crew refuse to automatically bow down and worship as their ancestors did 5000 years ago. Scotty feels the brunt of his anger when he takes exception to Apollo's interest in Carolyn but she agrees to go with Apollo and learn some of his secrets. Back on the ship Spock is driving the crew hard to break through the communications interference and the energy field that is holding them, slow progress is being made but they eventually succeed. Kirk and the landing party have deduced that Apollo is drawing his energy from the environment and more importantly via the temple, he has the ship phasers targeted on the building ready for the right moment. 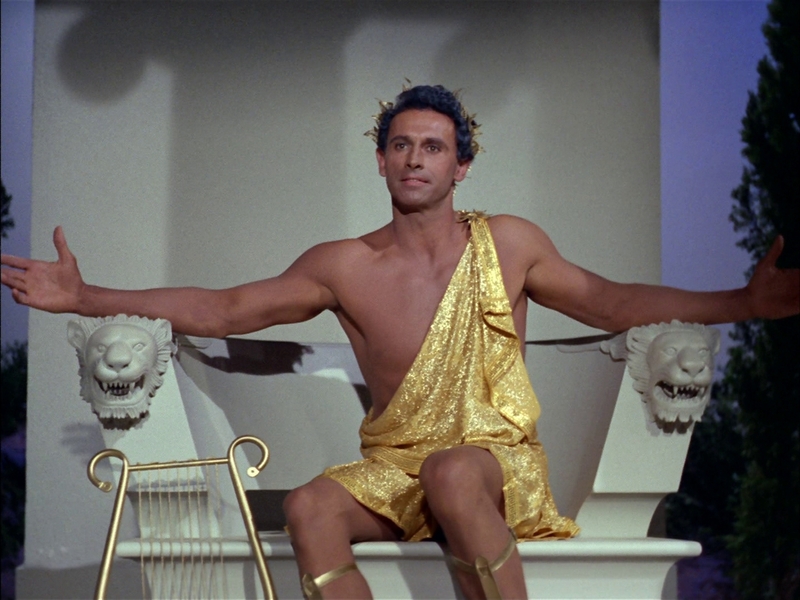 Kirk orders Lt Palamas to spurn the advances of Apollo to anger him and when he is drawing upon his power to punish her they destroy the temple and with it the hold this "god" like being has on them. Apollo is devastated and calls upon his fellow travellers to embrace him as he fades from this reality. We also get the notion that the Greek gods were indeed a space faring species that came across the Earth and "fed" off the worship of the primitive peoples in and around Greece at the time, say what you like the modern world owes an awful lot to the ideas and concepts that came out of that region regardless of who the people at the time considered deities. Of course one of the myths is how a few of the gods dabbled in the pleasures of human female flesh and Apollo has taken a serious shine to Carolyn and well not to make too fine a point she seems interested and I think we are supposed to believe that something happened between them, After the fact it came to light that one missing story element was that she ended the episode pregnant, a bit advance for US network tv back in the day it seems. I loved Spock and Sulu as they discussed scanning the planet for the energy source, scan where it isn't, there was some good chemistry between the two actors, pity it was never really developed. Kirk finally hatched his plan and and while the first attempt failed (thanks to Palamas) when he finally convinced her to turn her back on Apollo she did a real number on him and to be fair Palamas did a good job exploiting the attraction Apollo had for her, a lot of exposition was given as she talked to him. Uhura also got to flex her muscles with actually working on her communications board, we know she is more than just a switchboard operator but often the show doesn't do her justice so despite some dodgy dialogue in terms of what women were considered to be back then we also got two female characters performing well. Finally Kirk and Spock are communicating, the ship's phasers are targeted on the temple yet the guys are casually standing in the structure, that's pretty stupid and I really think it was set up that way for Kirk to do a run, jump and roll as he commanded Spock to fire. Oh and credit to everyone involved in creating the storm that Apollo launched towards Carolyn, all on stage of course but it looked pretty good. Who Mourns for Adonais? is one of original series stories that gets a lot of respect upto the point of being the kicking off point for the Star Trek continues movie “Pilgrim Of Eternity” and not forgetting the episode itself draws upon an established mythology that permeates western society. It's an interesting concept that the Greek gods were space faring beings who used their knowledge and technology to set themselves up as divine beings who like humans eventually could not put aside the base elements of some of their natures. In this episode Apollo seems impressed by the strength of character of his "children" but doesn't seem to realise how much they have changed perhaps because he hasn't in the 5000 years since being on Earth. For all the negative aspects he sees in Kirk and company he too expresses them with arrogance, indifference and anger combined with a fragile ego. Overall this could have been rather cheesy but good acting and some good effects worked in the episodes favour. Labels: Blu-ray, Random Trek 53, Star Trek, Who Mourns for Adonais?